According to Debbie Shaughnessy and Bob Polomski, horticulturist specialists of Clemson University, "Ornamental flowering fruit trees (Prunus species) are closely related to the orchard fruit trees that are grown primarily for their fruit. Although many of the ornamental flowering trees bear edible fruit, they are grown primarily for their springtime floral display and attractive form." The beauty of ornamental cherry trees makes up for their short life span of 15 to 20 years. 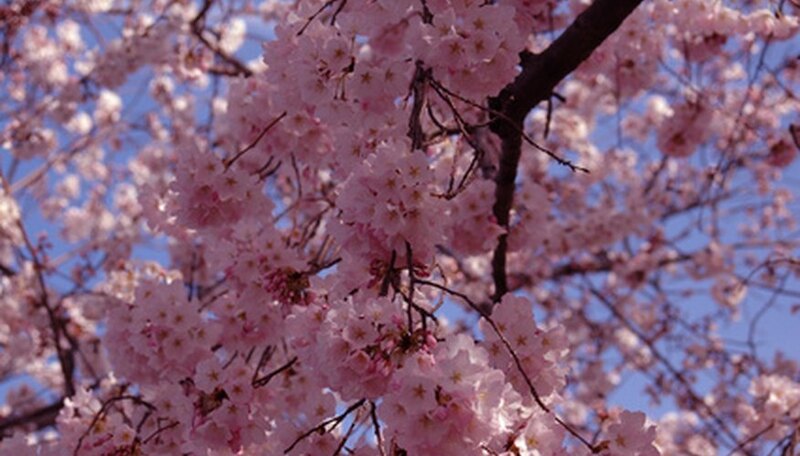 The Okame cherry tree blooms in early spring with fragrant, pink flowers with large, 1-inch petals. The blooms are arranged in two to five clusters. The Okame cherry tree thrives in USDA Plant Hardiness Zones 6 to 9, growing to 30 feet tall and 30 feet wide. This cherry tree grows well in both full and partial sunlight and has a high tolerance to drought conditions. In the autumn, the leaves turn bright red, orange and yellow, giving a showy display of color. The Muzzard oriental cherry tree features a cone shape and white double blooms that last for up to 10 days in early spring. It thrives in USDA Zones 4 to 8 and grows up to 30 feet tall. The limbs extend up to 30 feet wide. The Muzzard oriental cherry lives for up to 25 years. This cherry tree is planted for ornamental use, shade and bordering streets. This tree is hardy, drought-resistant, and tolerates winter weather. The Muzzard cherry produces fruit that is a favorite of birds. The Kwanzan cherry tree features large, pink, double blooms beginning in April. According to Jay Windsor, Agricultural Agent of the University of Delaware, this tree "gives the most prolific show of flowers of any other cherry tree." This tree also grows quickly to 25 feet tall and up to 25 feet wide. It is hardy, drought-resistant, and thrives in all types of soil. The Kwanzan cherry grows well in USDA Zones 5 to 9. In the autumn, it displays vibrant golden leaves. This ornamental cherry tree does not produce any fruit. The weeping cherry tree, also known as the Higan cherry, features elegant white flowers on limbs that fall in a weeping position, reaching the ground. Trimming the weeping limbs to a shorter length is also an option. The flowers bloom in the spring in USDA Zones 5 to 9. This cherry tree thrives in full or partial sunlight and is fairly tolerant of drought conditions. The Yoshino cherry tree was brought to America in the early 1900s from Japan. This tree features delicate white flowers that bloom in the spring. It grows to a height of 40 to 50 feet and a width of 20 feet for a large array of blooms. This tree lives for 15 to 20 years. The Yoshino cherry tree does well in drought conditions, most soil conditions, and full or partial sunlight. This tree thrives in USDA Zones 5 to 8.